One of the themes we often revisit in times of trouble is the long-term bull market in bonds. 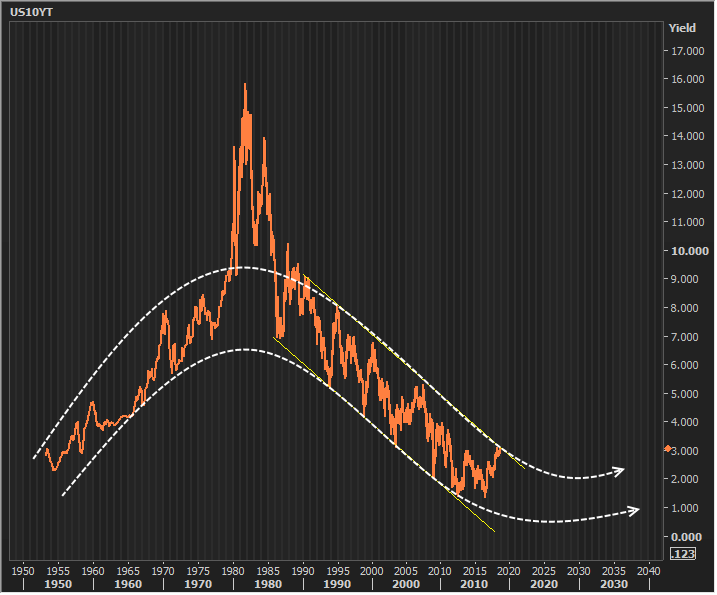 This traces back to the 80's and provides a shockingly linear set of lower highs and lower lows in 10yr yields. Most recently, we've seen yields rise back to the upper boundary of the long-term trend. There's still a chance they could hold ground here, but any further weakness means an official breakout. 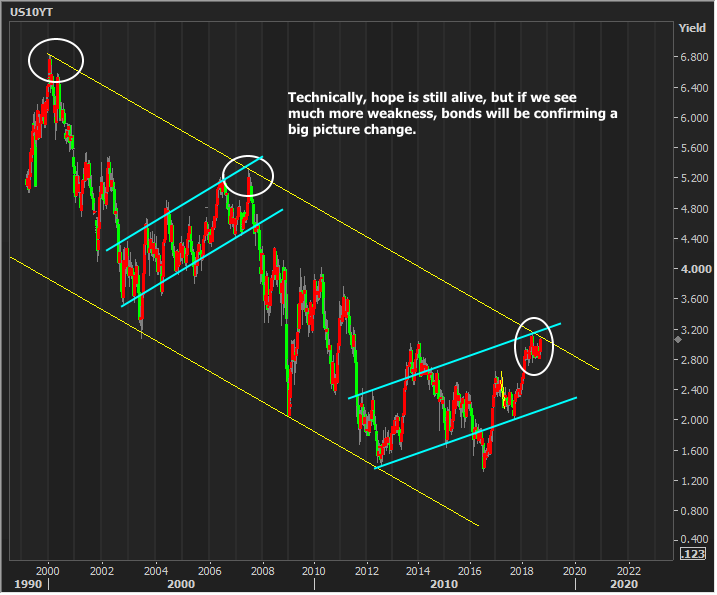 One other reason to hold out hope is that yields are also at the top of a shorter-term uptrend (teal lines). This could offer some technical support of its own, but it should be noted that the current version of that uptrend is much less linear than the one seen from 2002-2007. Incidentally, I think all of this "big picture trend" business is just a cheap trick (one I've often used) to help us feel better about recent selling sprees. Why a cheap trick? Simply put, it should be obvious to everyone that such a trend CANNOT continue unabated. Of course that would mean 10yr yields would be heading increasingly into negative territory and there's no conceivable scenario where that will happen, and no possible chance for it to happen persistently. With all of the above in mind, I think the best way to look at the big picture is with the early 80's as an ultra-high-rate aberration--one that made the decades-long bull trend in rates highly logical and linear. The central banking response to the financial crisis (0% rates or lower + QE at major central banks around the world) provided one last hurrah inside the long-term bull trend. Now it's time to find out where yields will settle down. In other words, lower rate momentum has atoned for the past and rates are now tasked with carving out a new, sideways future. That leaves room for more weakness in the short term as well as a friendly bounce . If you take away anything from this though, let it be that you shouldn't expect to be "saved" by the long term trend. In exploring our "new sideways," we could easily be talking about a range of 1%-4% over the next 10 years. Some analysts think we'll get close to that upper number within a year or two. I disagree, but we could still have more moderate weakness to endure in the short term before something comes along to provide some relief.